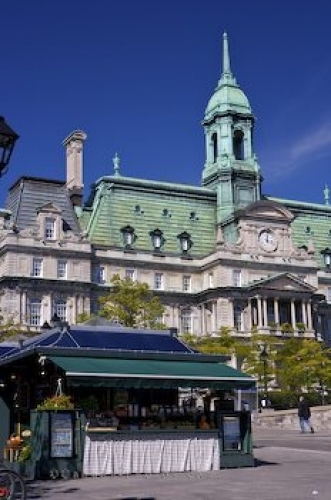 From Place Jacques-Cartier in Old Montreal, Quebec you can view the amazing architecture of the Montreal City Hall while a vendor finds the ideal location to set up a market stall. Visitors to Old Montreal love to browse through each market stall to see what sort of goods are for sale that are memoirs of their trip to Quebec, Canada. Montreal City Hall, Hotel de Ville, seen from Place Jacques-Cartier, Old Montreal, Montreal city, Quebec, Canada. Picture of a market stall in Montreal, Quebec in front of the historic building of City Hall.